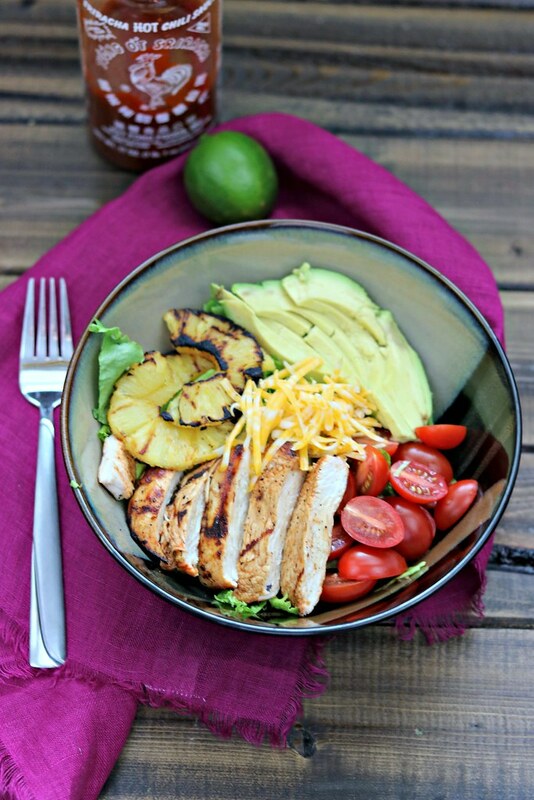 This Sriracha Lime Chicken Salad’s flavor and texture profile is on point. Oh, and it’s healthy, too! Happy Monday, friends. I hope you all enjoyed the Pumpkin Week posts last week. I know I have quite a few new recipes I want to try now. I hope you do, too! All the rain lately has made me a little antsy. I don’t like to be outside at all if it is raining or has rained. Mosquitoes in Texas are the freaking devil. I’m sure I’ve mentioned this before, along with how they swarm me pretty much anytime I’m outside. And that’s even without the rain. So…yeah. The rain also makes me lazy. I should take advantage of the time at home to get some extra cleaning or something done, but instead we usually just laze around the house and try to keep the toddler content and from pleading to go outside for the bagillionth time in the past five minutes. Love that kid, but geez. I can only hear, and agree to, “Ou’siiide!” so many times. And the epic, falling-to-the-floor, tantrum that ensues a milli-second after she asks and isn’t granted what she wants is something to behold. Two year olds, I tell ya. During the week, J and Nat usually get home before me and they have a snack and sometimes sit outside and wait for my arrival. Once home though, I pretty much immediately need to start dinner so that we can eat at a decent time. J is in charge of keeping the toddler occupied and sometimes that means taking her outside. I’m usually thankful for the quiet so I can hurry and get dinner done, but at the same time, I can see them out the window and it makes me sad to have to be inside away from them in what little time we have together in the evenings. So, when time and weather permit, it’s nice to be able to grill dinner – so we can all be on the deck together. 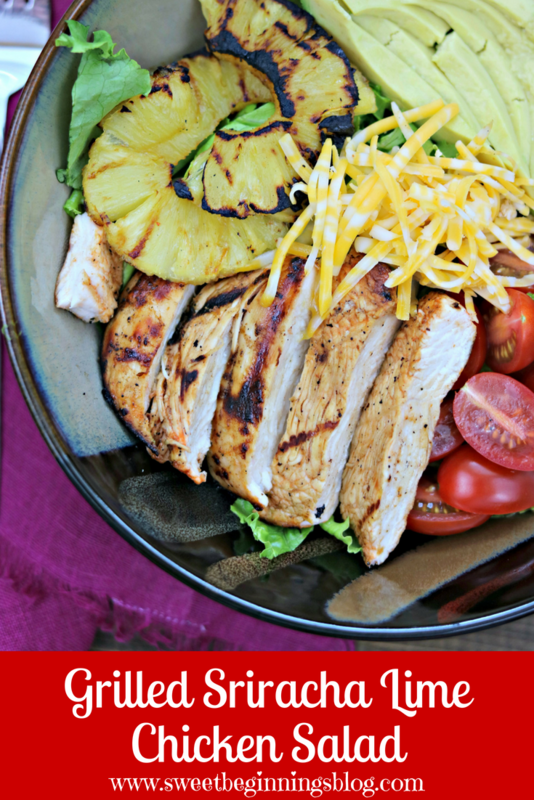 This sriracha lime chicken salad is one of those meals that allows us that kind of time together. 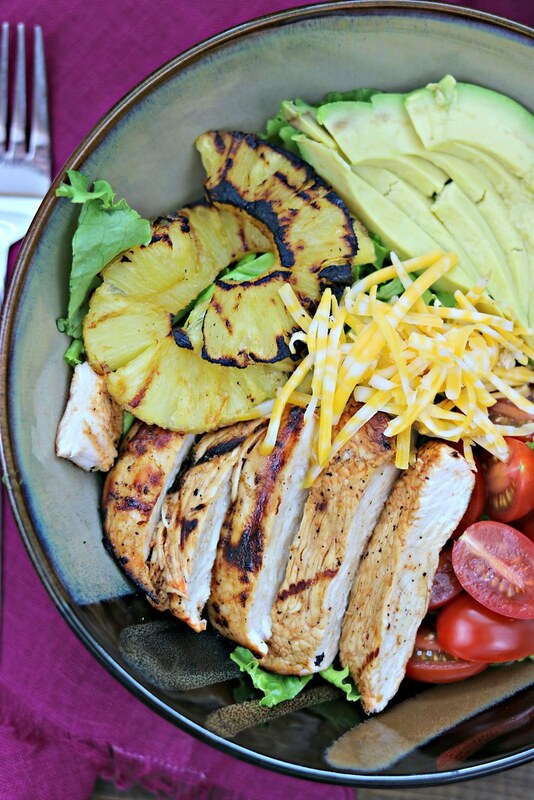 The chicken and the pineapple are grilled, so all I have to do inside is cut the tomatoes and avocado, whip up the dressing, and throw it all in bowls. 10 minutes, max. It’s amazing. Also, as long as it’s warm outside, we’ll keep grilling. You know…hold onto the last dregs of summer for as long as possible. Or at least until mid-October. That’s when I really get into fall and the upcoming holidays. But we aren’t there quiet yet – despite what the previous week’s posts might say. Preparation is key. But until the winds change – let’s keep the summer grillin’ going!! The chicken is a little spicy, with a tangy lime twist. The pineapple adds the sweetness, and the lime vinaigrette really seals the tangy deal. 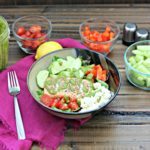 The salad is crisp and the avocado are creamy. It really is quite dreamy. Wait. What? I couldn’t help myself. It is husband and toddler taste-approved, and mom “healthy meal” approved. Which pretty much means it’s a win all around, and why are you still sitting here, you should be making this right now! This Sriracha Lime Chicken Salad's flavor and texture profile is on point. Oh, and it's healthy, too! Combine sriracha and lime juice in a shallow dish. Season both sides of chicken with salt and pepper and add to marinade, turning to coat both sides. Marinate for at least 30 minutes, but overnight if possible. The longer it marinates, the more that flavor sets in! Heat your grill, grill pan, or skillet over medium heat. Spray with cooking spray or brush lightly with olive oil, to prevent sticking. Add chicken and cook for 4-5 minutes per side, or until cooked through. This will vary depending on the thickness of the chicken. When done, remove to a cutting board and allow to rest for about 5 minutes before slicing into 1/2" strips or chunks. Add the pineapple to the grill, and grill each side until you have nice sear marks, about 2-3 minutes per side. Set aside until ready to assemble salads. Meanwhile, chop the lettuce, cut the tomatoes and avocado, and shred your cheese. Add all the dressing ingredients to a blender or food processor and blend until smooth and well-combined. Set aside or refrigerate until ready to serve. This can be done the day prior if you like and the flavors will really be able to set overnight! 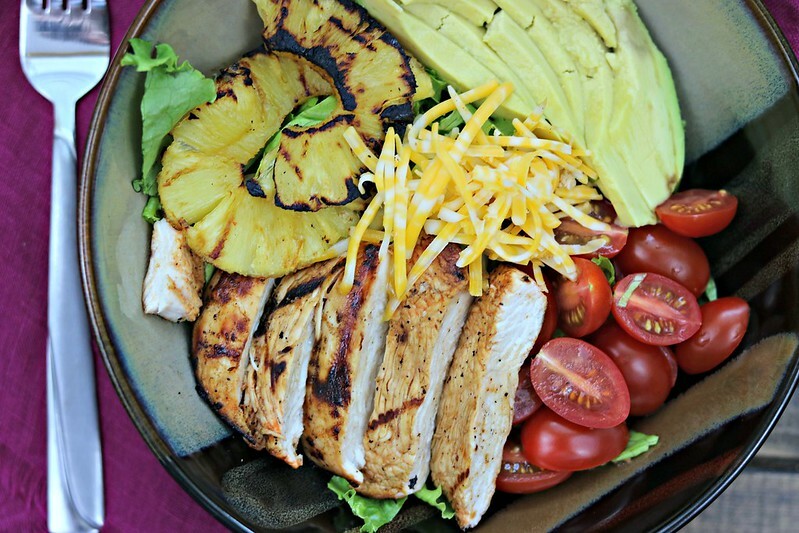 To assemble, layer individual bowls with lettuce and top with chicken, tomatoes, avocado, a couple of pineapple slices, and cheese. Drizzle with dressing, and enjoy!